I was sitting at the head of a small table in an incredible office looking over Regent Street. Everything, it seemed, was purchased out of the millennial section of the Ikea catalogue. At the table, arriving to sit in front of me, were heads of department from Procter & Gamble, Unilever, and some consultancy folk running the event. I had 10 minutes with them to solve a problem they all had: how to engage this well-publicised collective of 18-34 year olds that everyone seems to be having so much trouble over. The people around the table were very capable and very talented, but they couldn’t seem to solve the problem of engaging millennials. I was a 26-year-old entrepreneur with a few small successes to my name, who had just finished a global research project on millennials after working ‘on-the-ground’ and ‘in-the-trenches’ with them over the last five years. That is the opposite of what I meant and to what, in the long term, works. The reality is that the fastest growing companies, exciting start-ups, and the fresh-faced founders who are leading the charge into the future know that putting their employee happiness and wellbeing at the heart of their day-to-day strategy is how you win long term. I am going to show you it is way more than meditation or reading a 400-page book on millennials by someone looking outside-in, and that true wellbeing is attained through five main pillars, that for generation like millennials, are attained in a particular way. A note before I share these five pillars. Millennials have the same pattern as every other generation before and after them: they have unique traits on a macro level, such as being more focused on meaning, standing out, and making an impact. Yet millennials share very non-unique traits that all human beings experience – regardless of generation – as they transition through life stages. For example, your twenties (the life stage the bulk of millennials are currently in) are – and will always be – a time of high transition and uncertainty. That does not matter if you are a millennial or a Gen Z! Positive relationships – In my global study of what gives millennials strong identity, meaning and self-esteem in their lives, what became obvious is that 67% of people feel they don’t belong to the people in their work. Belonging is a need for any human being, and one that millennials struggle with due the current emphasis on being connected but missing connection. So, to have an engaged millennial workforce who value belonging highly, we need everyone feeling they belong to their team, it’s function, and you as an organisation. Too many organisations do not create a positive relationship between the individual, their immediate team, and the organisation as a whole. These are not relationships in which everyone smiles and agrees 24/7, they are instead open, honest, transparent and giving relationships. These types of relationships only come through experiences, and these can even be difficult or challenging experiences. Although away-days and team building exercises are a great way to do this, surrounding your up-and-comers with role models they can aspire to and mentors they can learn from is key. So is giving people in teams the responsibility to create social experiences and solve non-urgent but important organisational problems. All the above add meaning and build an individual’s positive relationships at every level. Self-acceptance – Simply being at ease with yourself and who you are is the cornerstone of a person with good wellbeing. Much of millennials day-to-day interactions with work, media and personal relationships cause them to question ourselves. Your rising talent needs to more than ever both understand and accept who they are and be taught to celebrate that – warts and all! This can be achieved by you helping your people understand what they really value, their core strengths, and how their experiences in life have shaped them. It is also vital that they create a healthy relationship with both failure and personal progress. Patience is often a trait that millennials struggle with more than the generations before them! Sense of purpose – Purpose is where most organisations go a little wrong. They tend to think about their people buying into the big picture of the company mission and vision. This is important, but if your goal is for people to perform better and stay within the company, a more effective strategy is to get their immediate managers to have them buying into the ‘why’ of the moment. This is because millennials thrive off meaning in what they do, and to put all their talent and efforts into something, they need to know why doing this project, this call, or this meeting, is important. This is what I call ‘connecting the dots’. You need to reinforce how daily tasks are directly linked to a bigger picture that is tangible to the individual. This can be as simple as explaining the ‘why’ when you give out a direction or command, so that every hour, or frustrating phase of the project, or client, is connected to getting closer to something that the person values. This is something preached, but rarely implemented well by managers and organisations as a whole. Personal growth – Millennials are generally impatient due to the nature of their surroundings today, and they want to feel like we are growing all the time. The fact is that the process of personal growth is obviously up and down, with times of confusion, failure and doubt often occurring. However, this is something that a generation used to instant gratification and high expectations struggle with more than generations before. For your young talent, their development must be in learning to appreciate the tough times that come with personal growth is just as important as the growth itself! Managers and leaders of your millennials must set a positive culture of failure and rejection, so that it is used as a gift, or signpost, toward personal growth. Autonomy – Everyone values freedom, but the up and coming generations value it even more in work with more options to travel, freelance and more. The famous phrase holds true, freedom isn’t free, and freedom in work without boundaries often cause millennials more harm than good as they try and decide where they fit in the world. A key part of freedom is the discipline to create freedom, and work must be done to set a precedent to your millennial talent that their discipline and commitment will lead to more freedoms in their role. It does not come overnight, but a clear, simple structure of how gaining more freedom can be set and motivate positive ways of working. 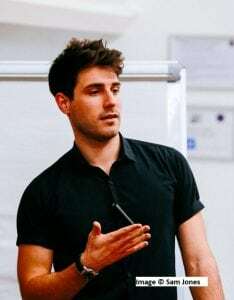 *Sam, as the founder of multiple successful companies (All In, TwentySomeone, TIME score) is an expert in well-being, mentoring and coaching since the age of 22. Click here to find out more about Sam, or give our team a call to check Sam’s availability for your event or conference on 02031377353 or email us on enquiries@raisethebar.co.uk.